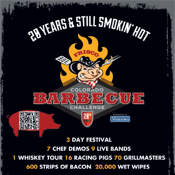 THE App for the Frisco Colorado BBQ Challenge event. It provides critical information, timely tips, locations, directions, scheduling, with the ability to let others know which events you are attending with live comments and pictures you take with your phone. Special discount offers are also in the app for all attendees who use it. Other useful tools are built in connections to Facebook and Twitter with easy uploading of pictures and comments. A QR Scanner. It even has a tool to help you find where you left your car! Download this app to make the most out of your Frisco BBQ Challenge App..